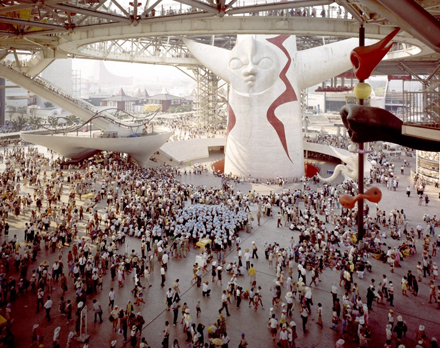 In 1970 the whole nation was gripped by the Japan World Exposition, commonly known as Osaka Expo ’70, and one of the main attractions was a work by the famous artist Taro Okamoto (1911–96) called Tower of the Sun (Taiyo no to). This tower remains standing to this day, and on March 19, 2018, after renovation work, it was permanently opened to the public for the first time since the expo. 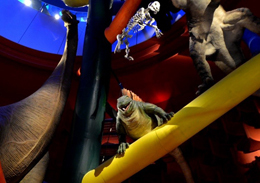 The following is an introduction to the attractions of the new Tower of the Sun, which, while restoring the work’s original dynamism, has been reborn as a safe exhibition space. Alighting at the park’s Osaka Monorail station, visitors are greeted by a face peering out from amid the trees of Expo Commemorative Park. 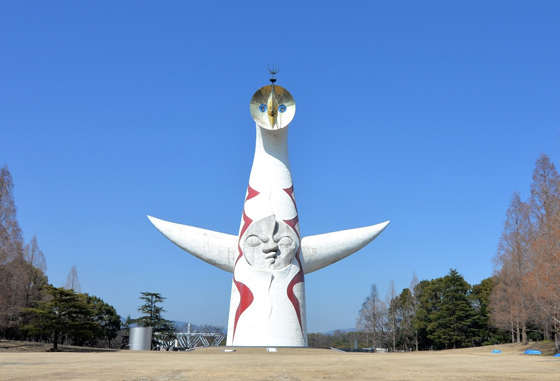 This is Okamoto’s Tower of the Sun, which stands near the park’s entrance. Although it may be difficult to appreciate from the photos, the huge monument is about 63 meters high. 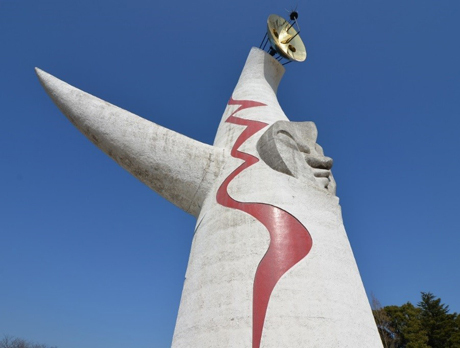 Forty-eight years after the Osaka Expo, the Tower of the Sun was opened to the public in March after Osaka Prefecture had carried out earthquake-resistance reinforcement work and extended the underground exhibit space at a total cost of about \1.38 billion. What kind of artwork was the Tower of the Sun originally? First of all, let’s take a look at a photo of the edifice taken at the time of Osaka Expo ’70. Numerous well-known architects participated in the exposition, and several very individualistic pavilions adorned the venue. Almost in the center of the venue, running from north to south, was the Symbol Zone. Since nearly all visitors passed through this Symbol Zone, it was a kind of flow plan leading them to the pavilions. 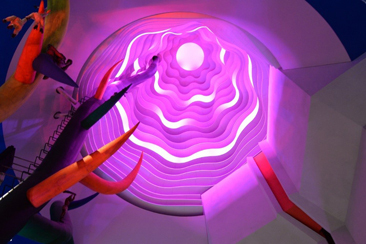 In the Symbol Zone there was the Theme Pavilion, consisting of the Tower of the Sun, Big Roof, Festival Plaza, and other facilities that served to convey the theme of the exposition itself. 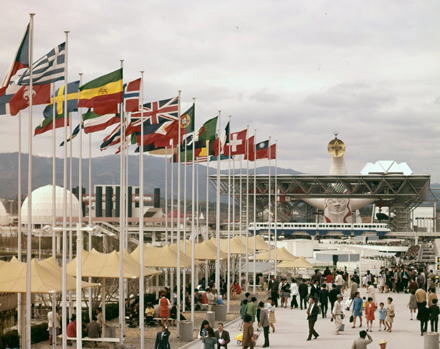 The daily number of visitors to Osaka Expo ’70 reached a high of 835,832 persons, and the aggregate total over the period from March to September was 64,218,770 persons. Completed in March 1970, under the Building Standards Act the Tower of the Sun was a temporary structure with one basement and two aboveground floors. The tower was scheduled to be demolished after the exposition, but a preservation campaign gathered momentum, and eventually it was decided to leave the artifact standing as an “object” under law on condition that it was permanently closed. Although some people did occasionally enter over the next four decades, for example to check the lighting of the Golden Mask face, in principle the tower was closed to the public. The Big Roof and other structures built at the time of Osaka Expo ’70 were removed, leaving only the Tower of the Sun standing in the park. Exposed to the elements, inevitably it began to suffer wear and tear over the years. In 2010 the Commemorative Organization for the Japan World Exposition, the administrator at that time (it was disbanded in 2014), requested Showa Sekkei, Inc. to carry out an earthquake-resistance examination of the tower, which revealed that the structure fell below the requirements of the Building Standards Act. The arm parts and upper torso of the tower were especially weak. In 2012 Suita City, the special administrative agency with jurisdiction over the tower, and Showa Sekkei began full-fledged discussions on renovation, including a redefinition of the tower’s legal status with a view to opening it to the public. While reinforcing the tower’s earthquake resistance and ensuring safety, the task of the renovation design was as far as possible not to alter its appearance, either externally or internally. Specifically, in order to allow people to enter, it was necessary to change the tower’s legal status from “object” to “building.” For that purpose, the tower had to be made to conform to current legislation. What emerged in the discussions were the issues of level number and legal interpretation of fire-resistance performance. The Tower of the Sun is not only a unique design on the outside. On the inside too, the various exhibits and wall panels blend together as one single work. 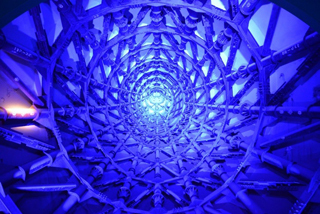 If fire-resistance coating were painted on the steel-frame arms, the appearance of the tower’s interior would change. If a hole were drilled into the outside wall to form an emergency entrance, it would not only spoil the external appearance but also have the demerit of decreasing earthquake resistance. Eventually, the area from ground level up to the arms was deemed to be one large first floor (ground floor), and the structure, with one basement and two aboveground floors, received designation as a semi-fire-resistant building. Since it was a large space, however, to ensure emergency fire escape safety, it was stipulated, among other things, that that a maximum of only 91 persons could stay inside the tower for 30 minutes. The Tower of the Sun is actually a mixed structure, with different parts having different construction types. The main body, from the ground up to the chest connecting to the arms, is a ferroconcrete structure. The ring part, that is, the chest between the two arms, is a steel-frame ferroconcrete structure. 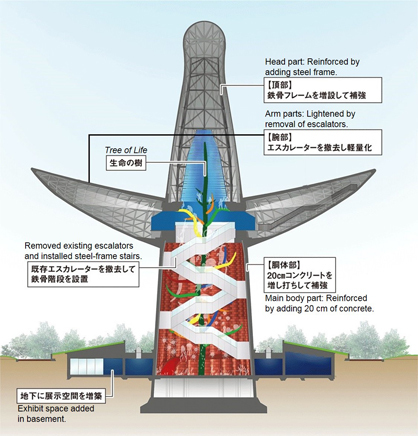 And the arms and head above the ring part are a steel-frame structure. The renovation work involved reinforcing earthquake resistance in only the main body and head parts. In the main body part, 20 cm of concrete was added on the entire inside; in the head part, a braced steel frame was added on the inside of the existing steel frame. 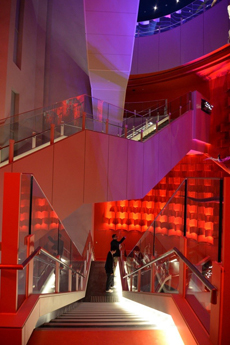 At the time of Osaka Expo ’70, four escalators were installed in the stairwell space inside the tower. Since there were so many visitors, however, it was necessary to keep them moving, so actually they had only five minutes each to view the interior from bottom to top. In the renovation work, the four stairwell escalators were removed and replaced by stairs installed in exactly the same places. 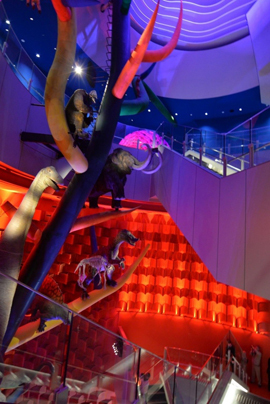 Another aim in installing the stairs was to enable visitors to view the works of art in a more leisurely manner than they had been able to do at the Osaka Expo. 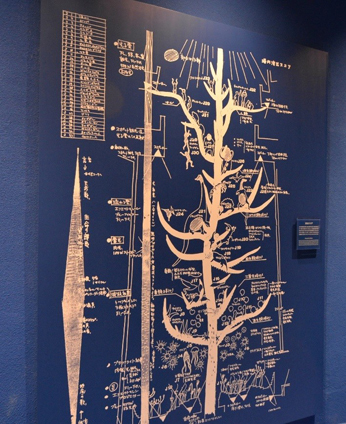 The interior of the tower features stairwell exhibit space, and the highlight, of course, is the Tree of Life, which has a height of about 45 meters. 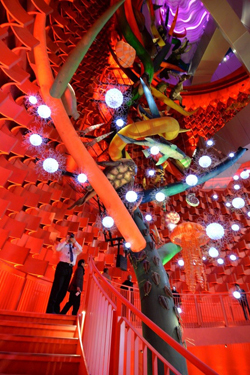 The Tree of Life is said to express the great power of life gushing forth from the origin of life to the future. As you climb up the stairs, however, it is the beautiful illuminated ceiling, called the Space of the Sun, that catches your eye. 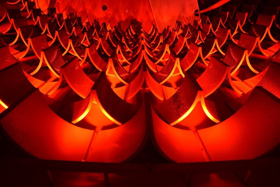 Reproduced after the renovation, the wave-like boards shine in red, blue, and other colors and seem to be luring visitors in. 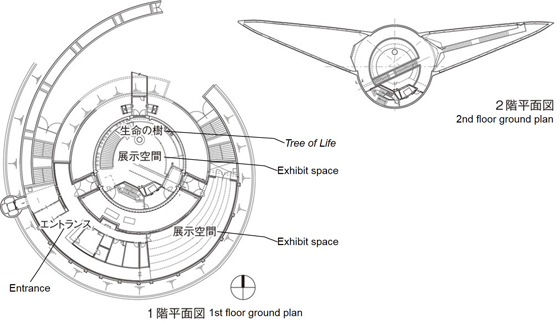 In the second-floor exhibition room, by the arm part, there is a display of Okamoto’s detailed production notes for the presentation of interior exhibits, featuring a combination of the exhibits, acoustics, and lighting. 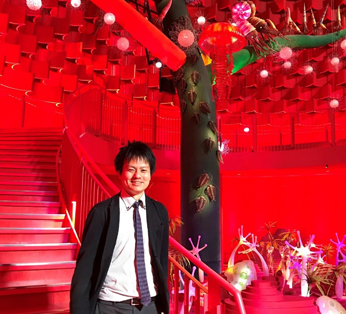 These notes show just how much Okamoto racked his brains to come up with ways of making a strong impression on visitors in the short time available to them. The Tower of the Sun was a huge project that was realized by the contributions of various creators, designers, builders, and other experts, led by Okamoto. Ittetsu Kuga, an assistant section chief in Showa Sekkei’s Architectural Design Department, who was in charge of the renovation design, explained that the aims of the project were to respect the background and history of the tower; to have designers, builders, and the creative team working on the interior exhibits introduce modern technology; and to leave the work of Taro Okamoto for posterity.